The A's made their first real player move of the offseason today, re-signing Jay Witasick to a 2-year contract worth $2.75M, with a club option for the third year for $1.75M. Maybe it's the #45 on his jersey, but Witasick just reminds me too much of Jim Mecir -- maybe okay stats, but you don't want him in there in a close game. Last year I just never felt comfortable with him in the game, and I expect more of the same -- I just have a bad feeling about him. Of course, this deal is certainly better than the 3-year, 9-million dollar deal that Mecir got, so even if Witasick tanks the cost isn't enormous. In other news, former Pirates and Mariners hitting coach Gerald Perry was hired to replace the deposed Dave Hudgens. I'm of the opinion that hitting coaches don't matter a whole lot, but we'll see. Finally, to no one's surprise, Scott Hatteberg's $2.8M option was declined. I have to admit that even though this move was obvious, I was worried that Beane's sentimentality about Hatte would shine through. With Witasick signed, we now have a full pen: Cruz, Kennedy, Witasick, Calero, Duke, Street, and that doesn't count Jairo Garcia or Ron Flores, both of whom are reasonable options. Could a deal be coming for a bat? Stay tuned. Ty Cobb is a very interesting character of baseball history. He was the first inductee into the Hall of Fame and was voted by sportswriters as the greatest player of the first half of the 20th century. At the end of the twentieth century, Babe Ruth was voted the best player of the first half of the 20th century, although neither player played from 1950 to 1999. Ty Cobb was also a tough guy, and maybe a bad guy. Whatever his personality was, there is no question, this guy was a great ballplayer. My wife picked a book out for me from the library a few weeks ago, it was called, "Baseball in California". It had many great stories, but perhaps the most interesting chapter was called, "the Last Days of Ty Cobb". 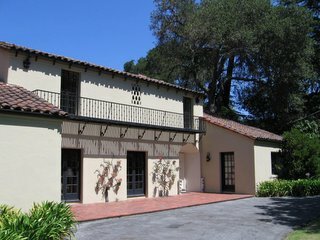 In 1930 Ty Cobb moved to Atherton, CA where he lived almost until he died in 1961. That is an affluent suburb of SF, not very far from my house. I drove there a few sundays ago and took this picture of Ty Cobb's house on Spencer Lane. Apparently Ty was wealthy in his later years, and he was active in the HoF and wrote to the Sporting News letters to the editor about problems in baseball. The house is pretty nice, spanish style. I rang the doorbell to see if the owners knew anything about Ty Cobb, but no one was home. I would have said, "Did you know the guy who used to live in this house had 4189 career hits, won the batting title 11 times and stole 892 bases?" One of the all time greats. It is kind of fun thinking of old man Cobb, ornery and crotchety in this house.